Seven Priests Cause Abortion Mill To Close! Irish Catholic priests have said that they will not reveal secrets given in confession even though new legislation by the Irish government will call for it. The new legislation will be introduced after another child abuse scandal in Cloyne, a Cork diocese came to light. As late as 2008, clerics accused of child abuse were being protected by the diocese the Murphy Inquiry found. The Irish government has now stated that a zero tolerance law will come into effect. However, the group that represents Ireland’s Catholic priests says the secrecy of the confession box must be retained. This directly contradicts new Irish government legislation which will state that the confessional is not beyond the law. “The point is, if there is a law in the land, it has to be followed by everybody. There are no exceptions, there are no exemptions,” said Irish Children’s Minister Frances Fitzgerald. “If I’m breaking the law then somebody has to find a way to address that for me … but in my own right as a priest what I understand is the seal of confession is above and beyond all else,” he said. “The seal of confession is a very sacred seal for lots of different reasons way beyond this one single issue, however serious this one single issue is,” Father Madden insisted. Irish Prime Minister Enda Kenny said on July 14 that canon law can not supersede state law. Minister Fitzgerald said the government was firm on this point. “This is about the law of the land. It’s about child protection. Are we saying … if a child is at risk of child sexual abuse that should not be reported? We cannot say that. The law of the land is clear and unambiguous,” she said. “This would make us the one and only country in the Western world to have such a law. Even revolutionary France in the days of its worst violence against the church did not pass a law requiring the breaking of the seal of confession,” Quinn told the Catholic News Service. Australian police are investigating a woman who entertained bids to buy her two children after she posted them for sale on eBay. The woman, from Geelong in Victoria, was investigated by police after placing an auction item along with an extensive sales pitch and photographs of her son and daughter – both under the age of 10. Several people placed bids on the children. Police contacted eBay after receiving a call about the listing late last week. The site took the page down and assisted police to track down the woman. She told police the sale was a joke. Victorian police said they accepted it was a joke and the woman would not be charged, but expressed concerns about the bidders in the auction. Police referred the case to the state’s department of human services, which is conducting a separate investigation. “We need to get to the bottom of why she did this,” a department spokesperson said. “This action could attract the attention of the wrong sort of people, whether it was a joke or not, and the family need to understand the risks and receive advice around that. An eBay spokesman said the case showed the risks of acting illegally on the site. “It demonstrates that anyone posting anything illegal on our site is extremely foolish,” he said. Dear Sister, I’ve heard people use the term prayer life or prayer journey. What does that mean? Usually when this type of question comes to mind, it is because the Holy Spirit is inspiring it! The answer lies in an understanding of the essence of what it means to be a human being. Each human person is made up of two essential parts, body and soul. The body we can see; the soul we can’t see. The body is material; the soul is spiritual. God dwells in the soul through grace. We call this the “Indwelling Presence,” or the “Divine Indwelling.” From time to time, each person becomes aware of the soul through an interior nudging of the Holy Spirit. In the innermost sanctuary of our souls, the divine encounter takes place at a profoundly deep level of our being. Because of the intensely intimate nature of a prayer that is this deep, this personal, this spiritual, it is hard to understand or discuss. It is too holy. 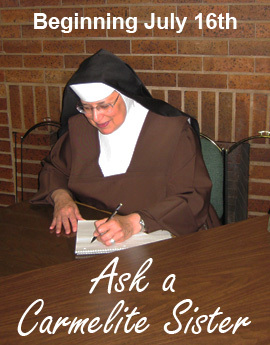 Our profoundly intimate encounter with God through prayer in our deepest center is the theme of Carmelite spirituality and the topic of the writings of the Carmelite mystics. Putting words to these experiences and explaining them, usually by way of an analogy, is Carmel’s gift to the world. St. John of the Cross, Carmelite mystic and Doctor of the Church, wrote four major works. Life can never be the same, once we discover that in the deepest center of our soul, we can live that intimate relationship with God for which we were created. Yes, we will continue our daily routine, but it will become a life lived from our deepest center, filled to the brim, good measure and flowing over – and because God is infinite, we can always go deeper. 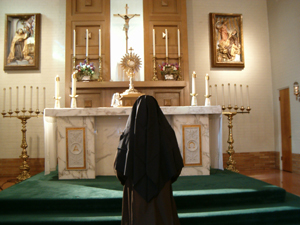 – Sister Laudem Gloriae, O.C.D.